Canon is launching three new digital presses designed primarily for the graphic arts market, targeted at advertising agencies, design studios, graphic designers, reprographic depertments, print shops, marketing departments of large organizations, etc. These are the imagePRESS C650 (C65 on the US market), C750 (C75 on the US market) and C850 (C85 on the US market), replacing respectively the imagePRESS C600i, imagePRESS C700 and C800 imagePRESS. 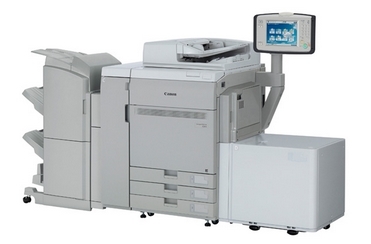 Compact and scalable, these Canon imagePRESS machines produce high print quality documents, particularly in color. Using Canon's CV Toner and the 32-beam red VCSEL laser, the imagePRESS are able to produce a wide range of colors with smooth image quality, accurately and with vivid colors. These imagePRESSes can print onto various substrates such as coated, uncoated, textured or recycled paper. Their ability to automatically print front / back on long sheets (30 inch / 76,2cm) to produce brochures, magazines or inlaid large packaging is new. In addition, the series can be equipped with the A-1 finishing unit, which features in-line stapling, and can make booklets, crease stocks or punch holes in it. These machines are already available in the US and will be available in Europe in due course. More information will soon be added to your DMO portal.